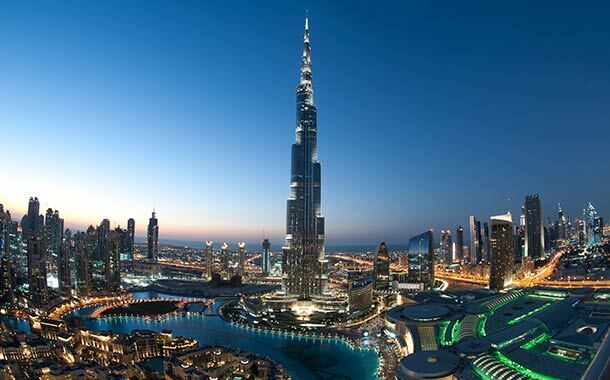 Embark on a classic tour to the world-class destination, Burj Khalifa, and witness the breathtaking 360-degree sweeping vistas of the Arabian Gulf. Begin your unforgettable journey to 'At the Top- Sky High' by stepping aboard the tallest tower’s 213-feet long moving sidewalk that transports you to the world’s fastest elevator. Take the elevator to the clouds for an extraordinary experience and let your jaw hit the floor as you ascend Dubai’s iconic skyscraper that dominates the skyline at a staggering 2,723 ft.
You also have the option to go sky high, at the At The Top SKY- Burj Khalifa, with access to a world class observation deck and the lounge on Floor 125 and Floor 148. A mesmerising blend of water, music, and light, this spectacle called the Dubai Fountain Show is a must watch during your trip to Burj Khalifa! If you would like to see the fountain show, you are advised to report there 30 minutes in advance to witness the show from a good spot. *The package is subject to availability. Additional options are available upon request. Children up to 4 years of age qualify for a free entry. Child rates apply for children from 4 years to 12 years old only. Children should be accompanied by an adult at all times. You will need to present your valid Photo ID along with the printed confirmation voucher at the entry point. Timings for Prime/Non-prime hours are subject to change. For At the Top (Floor 124): Non-peak hours are 08:30 - 17:00 & 19:30 -22:30 and Peak hours are 17:30 - 19:00. For At the Top SKY (Floor 125 + Floor 148): Non-peak hours are 19:00 - 22:00 and Peak hours are 10:00 - 18:00. Due to high demand, your preferred time slot may not be available; then you will be allocated a new time slot half an hour before or after your original choice. At The Top visit is confirmed for a specific time at the time of booking. Please report to the ticket counter 30 minutes prior to your confirmed visit time. 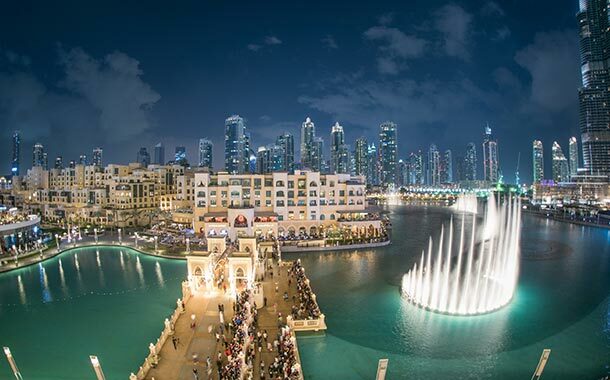 The Dubai Fountain show occurs daily from 6 PM till 11 PM. Dubai Fountain Management reserves the right to call off the show without prior notice. Prices are correct at the time of publication and are subject to change without notice. Prices aren't valid during peak seasons, such as Eid, Christmas, and New Year. Smoking or consuming alcohol is prohibited in all vehicles. Pictures displayed above are for illustration purposes only. Actual services may vary. Terms apply. *In the event of a cancellation before 7 days of the booked trip, full refund will be provided. For cancellations within 7 days to the booked Dhow cruise, no refund will be provided. Changes to itinerary can be implemented only 7 days prior to the booked cruise date.